In the fall of 2005, motivated by a desire to support local farmers, eat ecologically for the future of our environment, and support resilient economies, a small group of seacoast area farmers and consumers embarked on their first “Eat Local Challenge”, the goal being to eat only foods produced within 100 miles of their home. While the fun and challenging exercise proved there were more foods being produced than was immediately apparent, the group knew that eating locally could have a bigger impact if more people could get involved. 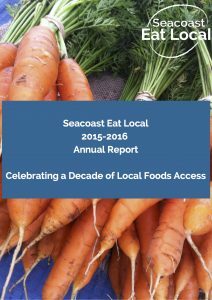 In 2006, Seacoast Eat Local began as a grassroots group, and produced the first edition of Seacoast Harvest, then a four page black and white guide. A website quickly followed as Seacoast Eat Local worked to find and share information about all the locally grown food that could be bought through farmers’ markets, farm stands, and CSAs. Just prior to Thanksgiving of 2006, a day full of driving to farms to gather holiday ingredients prompted the thought, just why do the markets close during winter? And the concept for Winter Farmers’ Markets was born. Much planning and risk taking on the behalf of farmers growing for a new season resulted in the launch of the Winter Farmers’ Market series in November 2007. Two markets were planned for that year, with a third added in February due to overwhelming success and demand. In the 2008 – 2009 season, 6 markets were held while we searched for larger locations to accommodate the increased interest by farmers and food producers looking to expand their sales and increase the diversity of products available all year long. By the 2009 – 2010 season, we were up to hosting a dozen markets a year in the two locations we are currently in, Wentworth Greenhouses and the Exeter High School. As the Winter Farmers Markets and Seacoast Harvest grew, Seacoast Eat Local became integral in supporting many diverse local food and agriculture initiatives, including supporting work to connect fisheries to direct to consumer markets, involvement in research for winter growing and sales, and supporting many events and projects with the goal of getting everyone to eat locally all year long. Early on, it was clear that more action would be needed if we were to reach everyone in our community. Low-income community members were not able to access the farmers’ markets to purchase fresh foods, and Seacoast Eat Local wanted to change that. After several years of research and planning, we launched our first SNAP farmers’ market pilot in November of 2011 at the winter farmers’ markets and have continued to grow the program continuously with plans for even more future expansion. To learn more visit these pages: Our Programs, Our Staff, Our Board and view our e-mail newsletter archives. To stay connected to the work of Seacoast Eat Local, sign up for our email newsletter, subscribe to our blog, and follow us on Facebook where we share information about farmers’ markets, farm specials, events and activities, workshops, recipes and much more! 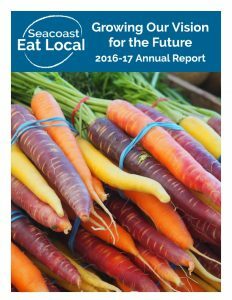 Seacoast Eat Local is a member of the New Hampshire Farmers’ Market Association, Farmers Market Coalition, and the New Hampshire Center for Nonprofits.